If you have picky eaters at home, you know how difficult it can be to get them to eat salmon. 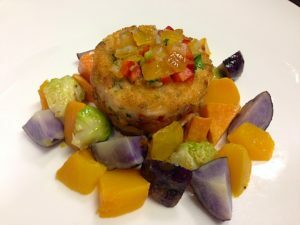 But it’s worth your effort because salmon is bursting with omega-3 heart healthy fats as well as vitamin D. These salmon cakes are crispy, light and make a perfect appetizer if made into a smaller size. In a medium skillet, heat 1 Tbs. of olive oil on medium-low. Add garlic, onion, bell peppers, 1/2 Tbs. of salt and 1/4 tsp. of pepper, cook until softened, about 4-5 minutes. Add flat leaf parsley, remove from heat. Transfer mixture into a medium-large bowl. Set aside to completely cool by leaving 10 minutes at room temperature, then transfer to refrigerator for 15-20 minutes. While vegetable mixture is cooling, finely cube salmon. Once vegetables have fully cooled, add raw salmon, eggs, paprika, 1 C. panko. Make sure everything is well combined. Makes cakes by shaping a handful of salmon mixture into 3/4 to 1- inch thick cakes. Pour another 2 C. of panko into a shallow dish. In a medium skillet, heat oil on medium-low. Dredge salmon patties in panko, coating both sides, then place into skillet. Cook 1-2 minutes per side or until golden brown. Immediately remove from heat and onto a paper towel to drain. Serve with a side of greens, as a burger, or on its own.